Colorado Craft Beer Week is coming to a brewery near you, March 18 – 24. We realize it is a month away but we here at Eat Drink Boulder got excited when we read a press release sent out today by the CCBW organizers. So mark this on your calendar and check back on their website as we get closer to the date. The press release provides a little history of the event. 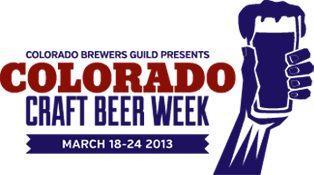 Colorado Craft Beer Week was originally created by Scott Kirkmans, a beer expert and brewer’s consultant, as “Colorado Beer Week.” This year, the Colorado Brewer’s Guild (CBG) has taken over responsibility for organizing, and growing, the celebration. There are now Beer Weeks in cities and states across the US, all designed to coincide with the national American Craft Beer Week, organized by the Boulder-based Brewers Association. In fact, there is even a BeerWeek.com website where you can find a list of all beer weeks. Colorado now has over 160 breweries and many of them will be participating with special events during this upcoming week. As of now, only Left Hand Brewery from Boulder County has an event listed on the CCBW website, the “Hops and Handrails” Beer Fest & Rail Jam on March 23rd. Tickets are on sale now. Check back to the Colorado Craft Beer Week website in the coming weeks for more events. Thanks for the heads-up. March 18 – 24 is now circled on my “Fun Stuff” calendar!